Pinwheel Ko, both the name and the position, was invented by Bill Taylor, a mathematician living in New Zealand. This diagram shows a pinwheel ko on a 3x3 board. If White captures at a, then Black must capture at b in order to avoid losing all his stones, and White must then capture at c, and so on. 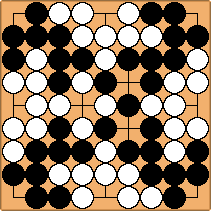 Under Japanese rules, the position keeps spinning around until the players agree to void the game. Under the superko rule, one player will eventually be prohibited from continuing the pinwheel, and so will lose.